BERKELEY, CA -April 9, 2016: The Stanford Cardinal vs the Cal Bears for the Big Meet at the University of California. Women's score: Stanford 114, Cal 48. Men's score: Stanford 86, Cal 77. While last weekend’s track and field meets may not have counted on paper, the Cardinal men and women continued to establish themselves as national contenders in numerous events. The team competed at the Stanford Twilight on Friday and the Michael Johnson Invitational at Baylor on Saturday, with record-breaking successes occurring at both meets. 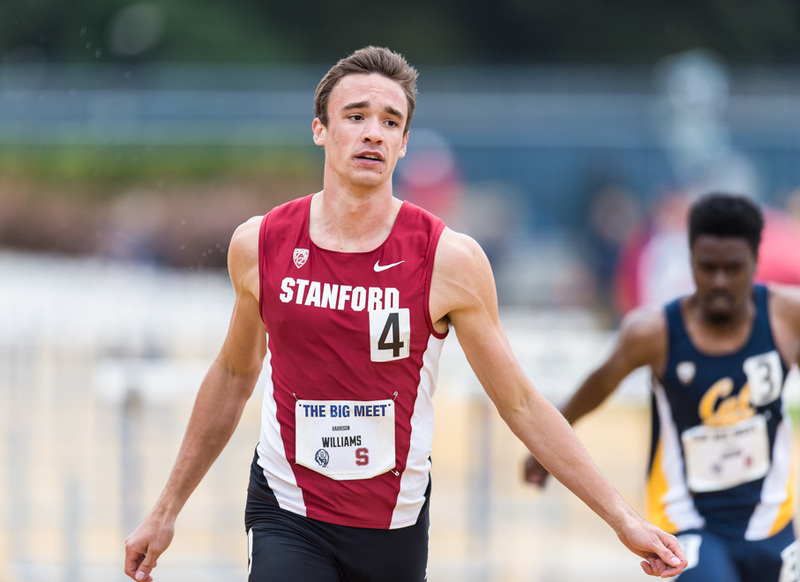 The Stanford Twilight primarily showcases distance running in the 800m, 1500m and 5000m, with 13 schools participating. One of the meet’s highlights was fifth-year senior Molly McNamara, who placed second in the women’s 1500m with a 4:15.22. This puts her at No. 4 on the collegiate list and No. 9 in Stanford’s list of all-time performers. “I just had to trust that it was going to happen at some point,” McNamara said about her impressive finish in her final campaign. Three additional Stanford runners also placed in the top 10 of the women’s 1500m. Senior Claudia Saunders (4:15.52) took fourth, sophomore Elise Cranny (4:16.37) took fifth and junior Vanessa Fraser (4:19.45) set a personal best in the race. “I feel like our whole program this year has taken a huge step forward,” Cranny said in discussing the team’s strong results in both the race and the meet as a whole. In the men’s 1500m, junior Sean McGorty (3:42.22) took third, freshman Grant Fisher (3:42.85) took fifth and set a personal best and senior Justin Brinkley (3:43.44) rounded out the Cardinal men who placed in the top 10. Other top finishers include freshman Amit Maity, who took first in the men’s 200m (22.77), and freshman Zac Espinosa, who took second (23.32). At the Michael Johnson Invitational, the Cardinal men’s 4 x 400 relay team broke Stanford’s oldest track and field record from 1978 of 3:06.60 with their time of 3:05.59. The team of sophomores Harrison Williams, Frank Kurtz and Isaiah Brandt-Sims and senior Jackson Shumway placed third in the event. Their record-breaking performance is even more spectacular considering this was the first time the group had ever run together in competition. Stanford is now the 10th-fastest school in the nation, and the men’s relay time will most likely qualify for the NCAA West Prelims. The NCAA championship field will then be determined from the results of that meet. Williams also took first in the men’s 110m hurdles (14.27), while Shumway took third in the 400 hurdles (51.39). The women’s 4 x 400m team of senior twins Kristyn and Kaitlyn Williams and sophomores Gaby Gayles and Olivia Baker also took first with a time of 3:33.96. In the women’s 400 meters, Kristyn Williams took first with a 52.99, giving her the eighth fastest time in school history. Baker took second with a 53.17, putting her at No. 5 on Stanford’s all-time performers list. Finally, Gayles took fourth in the event with a 53.76. This puts Stanford in a rarefied class with three female sub-54 quarter-milers. Junior Valarie Allman, the reigning Pac-12 discus champion, won the hammer with a 199-5, a personal best. She placed second in discus with a 190-11, another personal best. Both events this weekend were not officially scored, but instead provided competitors with the opportunity to improve their times and scores for NCAA regional competition as well as the Olympic Trials. Next up for track and field is the Payton Jordan Invitational, which will take place at Stanford on Sunday, May 1.